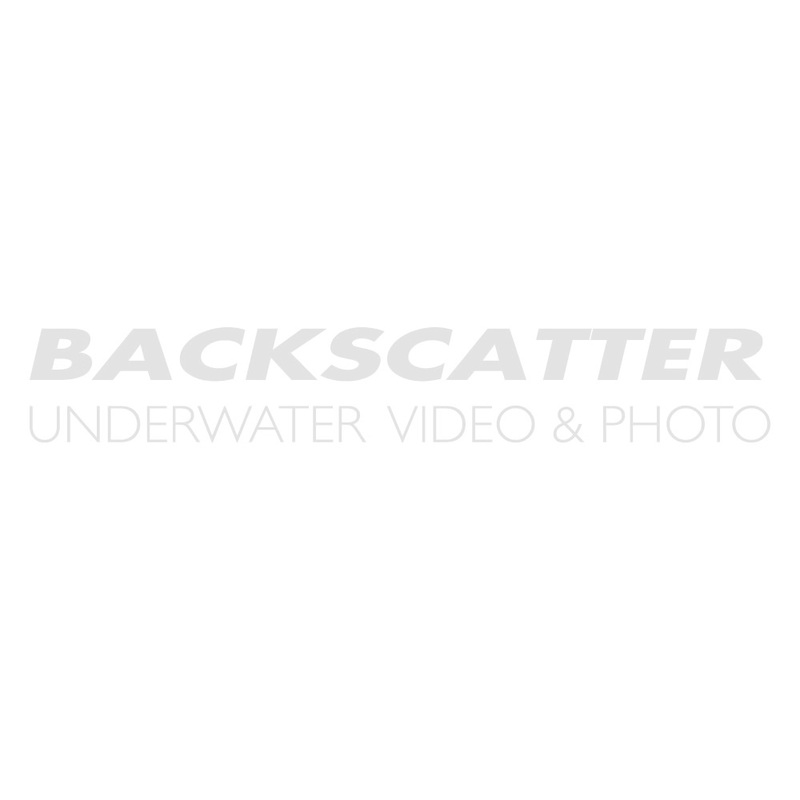 Backscatter is your expert resource for Panasonic HVX200 underwater housing options. We RENT and SELL the Gates HVX200 for the Panasonic AG-HVX200. Our Rental Gates HVX200 underwater housing features the optional high resolution monitor. Click the rental tab for rates or review the HVX underwater options below. Please call us with any questions! Perfect for zero downtime. 3 hour full charge, 80% in 75 minutes. This mount will adapt the Inon D2000 & Z240 strobes to the ReefNet Micro Snoot Fiber Optic Arm. Add two ReefNet Micro Snoot Fiber Optic Arm to add new complexity to your images. This mount will adapt the Sea & Sea YS-D1 & YS-D2 strobes to the ReefNet Micro Snoot Fiber Optic Arm. Add two ReefNet Micro Snoot Fiber Optic Arm to add new complexity to your images. Remove the standard, manual LED flash trigger and pop in a Nauticam TTL Converter for Nikon featuring the exact same physical form factor, but electronic TTL conversion electronics for automatic flash control. This is a user installable upgrade! Compatible with NA-D5 & NA-D500 Housings with Sea & Sea YS-D and Inon Strobes. This hotshoe mounted optical flash trigger provides automatic TTL Flash when used with Inon S-TTL and Sea & Sea DS-TTL Strobes connected by fiber optic cables. The TTL trigger also offers manual triggering, including rear curtain sync, with any compatible slave strobe. Accurate automatic TTL flash exposure has been a favorite feature of Nauticam photographers using cameras with pop up flashes, and Nauticam is excited to bring this advanced flash control functionality! The UW Technics NN-2/IS supports both optical and electrical strobe triggering and is compatible with popular strobes from Inon and Sea & Sea. With these flashes, optical strobe triggering is the way to go. The full automatic and manual functionality of the system is supported, and optical triggering eliminates problematic electrical sync cables. Fast Charge system of 1 hr 45 min. About 60% of all SUBAL older models of Nikon housings can be upgraded with this TTL system. It fits on holders for earlier version of SUBAL electronics for strobes and installation of device is very simple. SUBAL TTL V1 system uses two CD2032 batteries. Nauticam shipped a Flash Trigger unit for Canon in 2013, and it has proven to be an excellent tool for underwater photographers. Nauticam is now producing a version for Nikon, and it is an ideal solution for the Nikon NA-D4S. NA-D800 and NA-D600 shooters can also take advantage of the speed and convenience of this flash trigger, and since the pop-up flash is no longer the gating factor, the result is faster recycle, less heat build-up and better battery life. The Isotta Dual Fiber Optic Cable Adaptor for Compact Housings allow you to put two fiber optic cables in front of the built-in flash of the camera. This allows you to have one or two external strobes. The GoBe Action 850 Dual Video Light Package is an excellent combo for the GoPro and other compact camera systems. With dual video lights, you will be able to cover a larger area with very even light. The GoBe 850 lumen lights will work great in both day and night dives. Make sure you take advantage of this package! Our Sidekick Single Light Package is a compact and inexpensive GoPro lighting solution with a tray and single handle for greater shooting stability. Choose from either the flood only Sidekick with a 600 lumen flood beam, or the Sidekick Duo with both a 600 lumen flood and 400 lumen spot beam. Add on a Backscatter Flip filter system for the ultimate solution with perfect underwater color. The flash trigger plugs into the GH5 camera hotshoe and provides an optical signal for fast, continuous strobe firing. Automatic “TTL” flash is not supported, flash power is set manually on the strobe head.